Despite fierce opposition, both the Vatican and the central government in Beijing seem very eager to sign a deal on reestablishing diplomatic relations. Journalist Ian Johnson, who broke the story end January, and author of The Souls of China: The Return of Religion After Mao tries to figure out why both a so eager to push ahead, he tells at PRI. The real issue for both is about social control, he says. The Vatican has centuries of experience in China. It was Jesuit priests who first established a permanent place for Christianity in China starting in the 16th century. Francis is the first Jesuit to become pope, and he appears eager to heal the divide running through Catholicism in China by normalizing relations between the Vatican and Beijing. Those diplomatic ties were severed in 1951, soon after the communists took control of the mainland. Life for Chinese Catholics has been complicated, to say the least, ever since. For the Chinese government, re-establishing diplomatic relations with the Vatican would be a victory for public diplomacy. But the real motivation for Xi and his government is about social control, says Ian Johnson. Another attractive possibility for Beijing in all this is related to Taiwan, which China considers a renegade province. The Holy See is one of just 20 states with diplomatic ties to Taiwan. If normalizing the relationship with mainland China coincided with breaking the Vatican’s recognition of Taiwan, that would be something Xi could celebrate. For his part, Francis would like to heal the rift running through Catholic life in China. He’d also like to grow the church in that country. There are an estimated 10-12 million Catholics in China. By comparison, Protestants — and this is a low estimate — number around 60 million there. Legally, China does recognize Catholicism as one of the country’s five official religions. The authorities in Beijing even help appoint some Catholic bishops in China. This has long been a sticky issue for the Vatican. In recent weeks, the pope has shown he is willing to be flexible on this issue. Papal authorities asked two underground Chinese bishops to resign and make way for candidates approved by the Chinese government. “Many Catholics don’t feel comfortable going to the officially recognized Catholic Church, because many of those bishops and the priests under them, who they appointed, were not approved by Rome,” Johnson says. 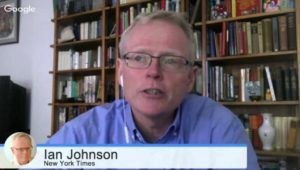 “It’s a difficult situation, and it slows the growth of the religion,” Johnson adds.